Overhead Door Company’s security grilles provide an array of attractive solutions for a spectrum of retail, commercial and industrial applications. Our side-folding grilles boast the shortest stacking dimension of any grille available today, and feature a handsome clear anodized finish (standard) in a variety of patterns and optional colors. We also offer a complete line of upward-coiling grilles. Constructed of aluminum, stainless or galvanized steel — with optional electric motor — these grilles are designed for durability and easy operation. 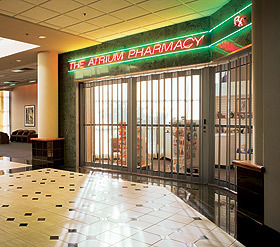 Our comprehensive line of security grilles affords both reliability and peace of mind. -Minimum clear pocket widths of 8″ (203 mm) on standard-width models. Minimum clear pocket widths of 13″ (330 mm) on wide-body models require less depth.